A graceful loop shows your love has no end. No one can discern where you begin or where the other ends for you and your beloved are one. The Song of Songs is King Solomon’s blush-inducing book about two lovers delighting in one another. This quote comes from chapter six, verse three. It celebrates a love story steeped in beauty and intimacy; both physical and spiritual. It’s so much more than just a necklace. 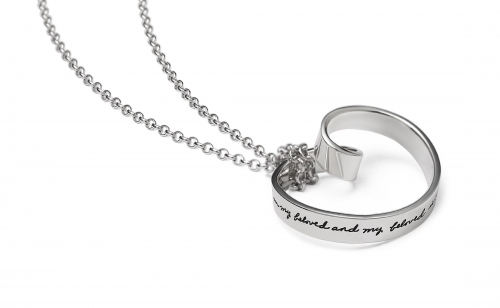 This sterling silver gift is a physical representation of your divine bond. When your beloved opens it, she will beam with joy. We individually engrave each piece with romantic script and then polish it by hand. This is a gift that will be treasured forever.